I dream of the day that the fiance and I can afford to buy a cottage on the lake I spent every single summer at as a child. I have a "Lake House" file on my computer with lots of pretty inspiration pictures. Think water, deck, boat, lots of trees and a pretty hammock hung up between two trees for those lazy summer days. I just found a few more images to save from Sarah Richardson's Guest Cottage portfolio- its making me want to quit my Starbucks habit so I can get my lake cottage that much faster. One lake house must of mine? Lots of guest bedrooms so I can share my lovely home with all my friends and family! Love these rooms! 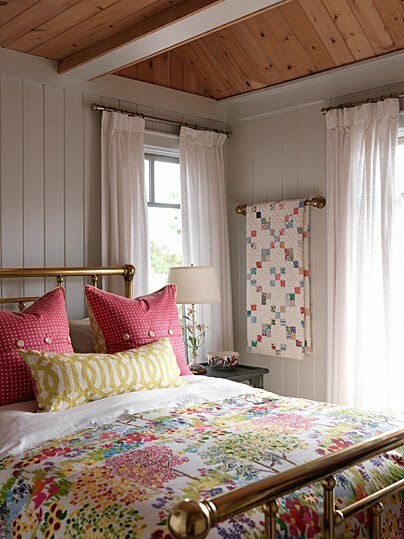 The headboard fabric in the first room is gorgeous in real life...embroidered linen. Swoon! totally stealing these for my file too! I'm glad I'm not the only one who thinks I will one day have a lake house, a country house, a city apartment and maybe a beach house :) got to be prepared for whatever life has in store, right? Ha. Jennifer, if I'm going to be dreaming I might as well dream big right? Love the headboard in the first picture! My husband and I also really hope to be able to afford a lake house one day - we've had some good friends in our life with lake houses and they are great places for relaxing and making memories with family and friends - hopefully it works out for both of us! We also dream of our own lake house! We rent one every summer in NH and I spend my days on the dock designing my future house. There is nothing better than time on a lake. Great post. I love all the bedding really gorgeous!! LOVE all of these images. Saving them now! 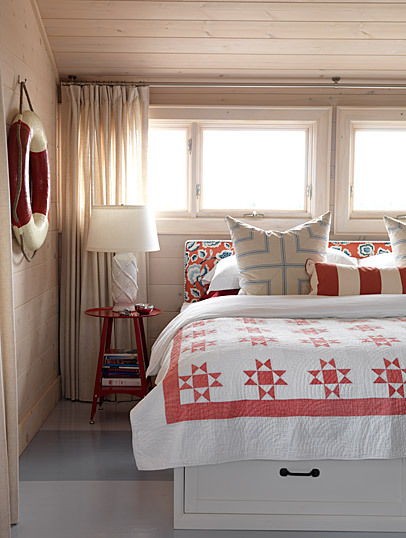 Love the idea of a lake cottage with quilts and high gloss painted floors. This is great! Love all of these rooms. It's the perfect blend of cottage and contemporary! 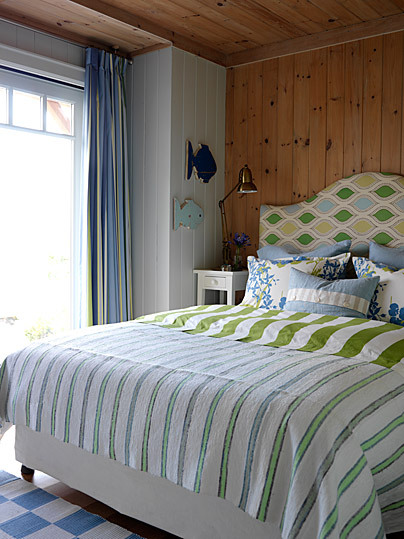 especially love the light cotton quilts, which remind me of my own childhood at the beach. Funny, it doesn't smell like a must ole lake house? Sweet spot.....when are we going? I love your lake house. Will you invite me? I love the simplicity of the rooms. I concur..a guest house need a bunch of rooms. Lake houses are the best. I hop you get one of your very own here not too far off into the future. I love all of it! My family used to vacation on a lake in NH when I was young, and someday I hope to have a lake house of my own, too! What fun! I hope you and your fiance can find the perfect one! I love the way all the fabrics are mixed! invite me! i want to get away this memorial day!